Image by The Georgetown BID used with permission. 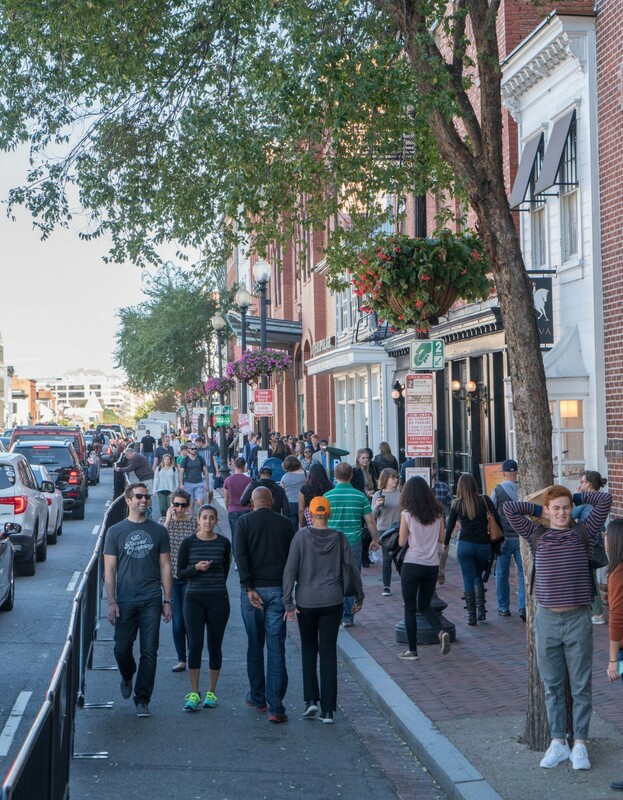 Each weekend from the start of April through the rest of the year, a busy retail strip in Georgetown will swap on-street parking for more space for people to walk around. The “temporary sidewalk” has been a hit in the past, and the folks behind it want to make it even better this time around. How would you do that if you were running this project? 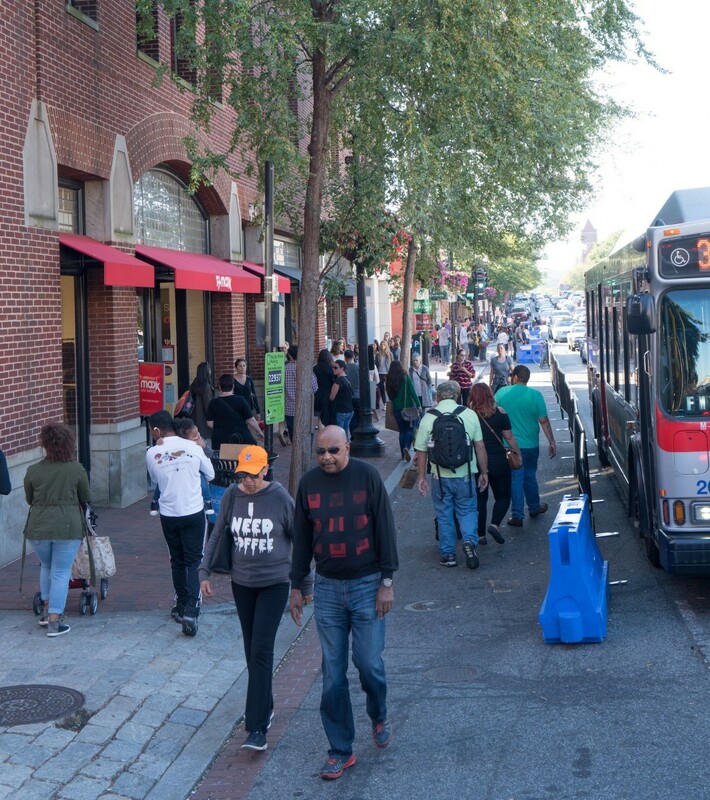 For one weekend in 2014, M Street NW, home to Georgetown’s popular commercial corridor, got an extra eight feet of sidewalk on each side of the street between Wisconsin Avenue and Potomac Street. The Georgetown Business Improvement District (where I work) built them by using metal barriers to keep cars out of space typically reserved for on-street parking, instead granting it to people on foot. The BID did the same in 2015, this time stretching the sidewalks from Wisconsin to 33rd Street NW (a total of 900 feet long). In 2016, the BID extended the program to include all weekends between April 2 and October 23. Merchants in the area said it helped business and made it easier to walk along the street. Georgetown residents told us that it made it easier to walk along this stretch of sidewalk on busy weekends. An unexpected outcome of the sidewalk project was that vehicular travel on these blocks got slightly faster since there weren’t cars trying to parallel park from the second lane. And while the BID did borrow around 65 parking spaces to make this happen, there are garages and lots nearby with more than 950 spaces available throughout the weekend. The stretch of M Street that will have wider sidewalks each weekend from now until 2018. Image by Google Maps. We can make the sidewalks even better this year, but how? M Street will again get wider sidewalks between Wisconsin and 33rd this year, this time during each weekend from April 1 to December 31. And since the basic effort has been a success for multiple years running, there’s opportunity to make it even better by ensuring the extra sidewalk space is more beautiful, welcoming, and easy to use. For example, we know we can add things like planters, furniture, street art, signage, or activities that make the space more lively and welcoming. Image by Robert Breckenridge licensed under Creative Commons. The challenge, though, is that the wider sidewalks won’t be permanent. We’ll need to set up everything on Saturday morning and take everything down on Sunday evening. In between those times, everything will largely be unattended. And while we have some ideas for how to solve the problems we’re up against, we also want to know if anyone from the public has suggestions. This is, after all, public space. Lightweight but substantial. All the materials we used last year—water-filled barriers, crowd control barricades, cable-covers—were lightweight, which made it easy to drop them off and pack them back up, but also hard to move once filled with water or sand or interlocked with one another. Cheap but premium. We need to be able to afford whatever we put out on both sides of street, so it has to be relatively inexpensive per unit. At the same time, we need it to look great. Easy to store, logistically simple. We have limited storage space, so everything we use needs to be able to rack up close together, stack together, or nest in one another. In other words, it all has to be easy to store. Also, we unload everything off of two flatbed trailers pulled by pickup trucks, and everything, including the water we use to ballast materials, has to fit on these transports. Logistically we have to fit whatever else we do on the remaining 4’ x 8’ area of our trailer, in a truck bed, or have it stored in a retail shop near where it will be set out. Striking, and unique to Georgetown. Whatever we do should also be unique and help to define Georgetown’s sense of place. We want to make a big impact, so we want things that make a statement or have a sense of presence. One great example we have in mind is Montreal’s Quartier des Espectacles, which has really great custom barricades, modular concrete furniture, along with specialty furniture and art that has a strong sense of Canadian identity. If you have ideas, we’d love to hear them. You can email me your thoughts at whandsfield@georgetowndc.com or leave them in the comments. We believe that building and sustaining a pedestrian-oriented retail district requires projects like this one, and we’d love to get better with every deployment. If you haven’t seen this program yet, it starts again on April 1 and we’d love to share it with you.